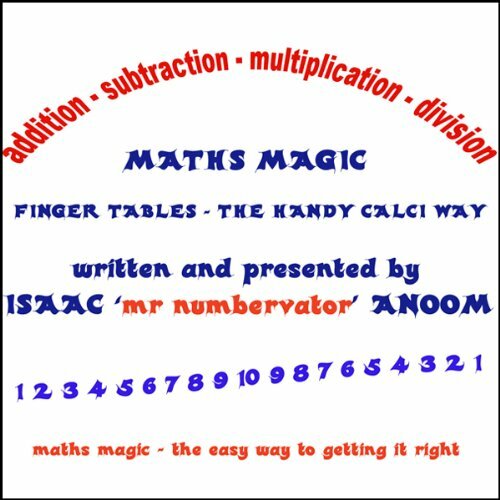 So, if find maths difficult, sometimes boring, never get good grades, Isaac through Maths Magic will change all of that. You will lose the fear, raise your achievement, be the envy of your peers, impress and amaze your teachers and ultimately get the good grades you've been after, thought you could never get and ignite the maths passion in you. Good luck! In this programme Isaac explains how to use your hands as a calculator to quickly work out the 6 to 10 times tables. Taught this to year 3 class today, they loved it. Anything that makes learning tables more fun for kids has to appreciated. It gives more hesitant students the confidence to enjoy maths; once they master the huge hurdle of "tables" they can focus on the more complex material. Thank you Mr Numerator I felt like I was performing a magic trick for the class, a great time was had by all. The basic teachings are sound, although very limited in its application. It is hard to listen to the same introduction for 1 ? min. I take objection to his suggestion that others do not want us to know these things and the suggestion that one learns so that we can challenge and beat the teacher in front of the rest of the class. This is likely to annoy the teacher and so hinder the child?s progress.